Projects the size of the South Road Superway construction need great surveillance and guidance. Davis Langdon, an AECOM company, was in charge of this guidance and employed UniPhi’s project portfolio management software in order to create and maintain transparency throughout and within the project environment. The Flexibility of UniPhi for Major Projects allowed it to support, calculate and justify a complex fee contract. UniPhi’s software was also used so schedule surveillances and document their results. The South Road Superway includes the creation of a 4.8 kilometre non-stop, north-south transport corridor between the Port River Expressway and Regency Road. It also includes construction of a 2.8 kilometre elevated roadway. 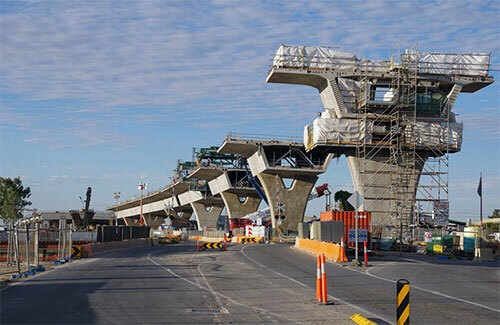 The project is part of The Australian Government’s $500 million commitment towards the upgrade of South Road, providing $406 million to the project, in partnership with the South Australian Government’s Department for Transport, Energy and Infrastructure (DTEI). As the Independent Reviewer, Davis Langdon and AECOM will manage and control independent review of design of the South Road Superway Project through the design of the D&C phase of the project and certification of the completed design. During the construction phase of the project Davis Langdon and AECOM are responsible for conducting surveillance of constructed works. AECOM is a global provider of professional technical and management support services to a broad range of markets, including transportation, facilities, environmental, energy, water and government. The independent reviewer is the chief quality assurer for the government during design, construction, testing and commissioning the road. This means its systems and processes need to be transparent, robust and have their own in-built quality control points. The Independent Verifier faces several risks in the selection of a system to support its processes. Stakeholder communications can vary greatly as the project progresses and the need for quick responses to press releases, site investigations and other client information requests is paramount. Users of the system are from multiple organisations, a complex system that required significant levels of training will lead to restiance and the creation of shadow systems being used with a resulting loss of transparency. The key to reducing resistance is for the tool to help support record management workflows for those on the ground. This then enables a simpler document control model to be implemented as it can be leveraged from the existing records already entered. The contract for this particular deployment was also very complicated hence making the financial management of their fee as the Independent verifier on the $812m South Road Superway project very challenging. In addition to the document and records management, The IV was able to utilise some of UniPhi's other features like timesheets and contract administration to track their overall fee on the job and measure overall project performance. UniPhi tracks each team member's time and compares this to budget hours on the job, calculating discounts owed to the client and productivity bonuses based off contractual performance criteria. This is converted into Actual and Budget $ values using standard cost and revenue rates. UniPhi's reporting capability is then utilised to produce "S" Curves and other trend based financial reports for the IV management to review. UniPhi’s document management and reporting capabilities enables streamlining of the document control process and internal workflows, meaning that inter-team communication is enhanced and service level agreements are easily met. UniPhi has been integrated with DTEI’s own system to make the process seamless and efficient. An innovative product development, which is proving to be a huge benefit to the construction surveillance team, is the ability to capture photos and complete surveillance checklists on-site using Android Tablets directly into UniPhi. This has eliminated the need to scan checklists and photos back in the office enabling reviewers more time on-site and more time working with the contractors. Reviews can also be ‘live’, not having to be delayed by more paperwork. The ultimate goal was for a simple and flexible system that allowed for changing requirements as the project progressed. This goal has been exceeded through the use of UniPhi's unique programme management functionality. Key to the success of this deployment has been the flexibility of UniPhi. Large, high profile government projects are a moving feast in terms of reporting requirements. UniPhi enables the IV to be confident in their reporting and efficient in its supply.